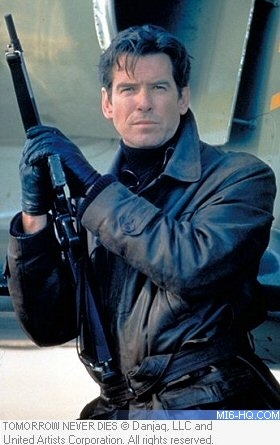 007 sets up a cruise missile strike on a terrorist arms bazaar near the Russian border. Upon spotting nuclear torpedoes loaded on jet, Bond charges through the market to commandeer the plane and fly it to safety before the missile hits, preventing radioactive plutonium being spread across the area. The title is not used directly in the film, but "Tomorrow" is the name of Elliot Carver's newspaper. 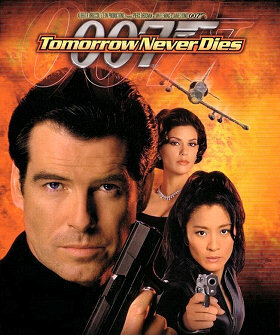 The film was originally titled "Tomorrow Never Lies" before a typing error in a fax inadvertently suggested the change. 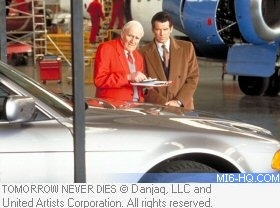 One cut scene involved Bond returning his rental car. At the end of the car park chase saw Bond remarking "the keys are in the car" to the Avis lady. Reportedly toned down for a 12 cinema certificate in the UK, a further 6 seconds of cuts were required to retain this rating for the video version. All use of shurikens (throwing stars) and a bad guy having his face stamped on were removed, and most of the fight sound effects were reduced. Full details on the cuts made and later restored in the Ultimate Edition DVD can be found here. Roebuck: "With all due respect, M, sometimes I don't think you have the balls for this job." M: "Perhaps. But the advantage is that I don't have to think with them all the time." 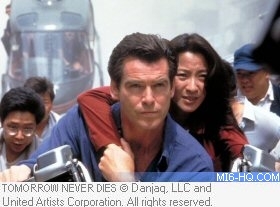 Helicopters can not physically perform the movement used to trap Bond and Wai Lin in dead end of the alleyway. Bond 'meets his match' in Wai Lin, the first time Bond performs a jump on a motorcycle and the fabulous car chase in the hotel car park.